1. 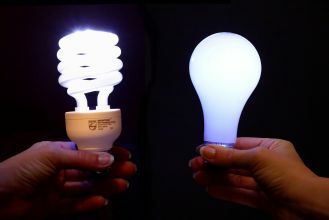 Replace light bulbs with CFL (compact fluorescent) light bulbs. I know you heard it a thousand times but there is a reason you heard it a thousand times. They use 75% less energy than incandescent bulbs and last up to 10 times longer. Keep in mind that CFL’s don’t last as long when they are frequently switched on and off. For most areas of the United States, a general rule-of-thumb for when to turn off a fluorescent light is if you leave a room for more than 15 minutes, it is probably more cost effective to turn the light off. Or in other words, if you leave the room for only up to 15 minutes, it will generally be more cost effective to leave the light(s) on. In areas where electric rates are high and/or during peak demand periods, this period may be as low as 5 minutes. 2. Stop pre-rinsing your dishes before you put them in the dishwasher. It’s unnecessary, and you’ll save up to 6,500 gallons of water per year. 3. Do all your washes in cold water, yes, even the whites with bleach. Today’s laundry products are designed to work just fine in cold water and you’ll save about $60 a year. 4. Save $25 to $75 in electricity each year by using the system standby or hibernating feature on your computer. Check out MichaelBluejay.com for more information on how much electricity your computer uses. 5. Plug home electronics, such as TVs and DVD players, into power strips; turn the power strips off when the equipment is not in use (TVs and DVDs in standby mode still use several watts of power). 6. Minimize your dryer use. It will save energy, your clothes will last longer (less exposure to heat) and you’ll save ironing, too. Take out clothes when they are still a little damp, and line dry them on hangers, drying racks or (if the weather’s nice) on a line outdoors. 7. Keep car tires properly inflated. According to the U.S. Department of Energy, underinflated tires alone cost the country more than 1.25 billion gallons of gasoline annually. 8. See whether you can get rebates for purchasing energy-efficient appliances. Enter your zip code at the U.S. federal government Energy Star website to find out. 9. Clean or replace furnace filters monthly during the heating season. Clogged filters force the blower to work longer, raising your electric bills. 10. Insulate and seal cracks and gaps in your ducts. That can help reduce energy costs by 30 percent. 11. Lower water-heater temperature to 120 degrees from 130 and insulate hot-water pipes to cut your energy bills by up to 5 percent. Just check the owners manual on how to do this, if you can’t find your owner’s manual you may be able to find it online at the manufacturers website. Also don’t forget to install a water heater timer and low flow shower head for even more savings. 12. Weather-strip old windows and doors and you’ll reduce your heating and cooling costs by 15 to 30 percent. 13. Move the thermostat to an inside wall away from windows and doors so that drafts don’t cause the heating system to cycle on unnecessarily. And consider getting a programmable thermostat so the temperature will automatically be adjusted at different times of the day. 15. Do your own home energy audit; the U.S. Dept. of Energy explains how. Or call a professional energy auditor. They use a blower door or infrared photography to pinpoint where your home is leaking energy. Some utilities provide free audits; you can also find certified professionals in your area through www.resnet.us.